The same day Dereck Rodriguez ordered a dozen bats, he found out he wouldn't need them anymore. Two years after the Twins took him in the sixth round of the 2011 Draft, the son of Hall of Famer Ivan "Pudge" Rodriguez" was still roaming around the Rookie-level leagues with a .216 career average as an outfielder. No new pieces of lumber were going to change that, but Minnesota knew the then-21-year-old still showed promise. So even though he pitched fewer than nine innings during his senior year of high school, Rodriguez transitioned his wiry frame and strong arm to the hill. Four years ago, Rodriguez started his baseball career over from scratch. Last November, he got another fresh start -- this time with the San Francisco Giants. But after his scoreless performance on the mound Monday, the right-hander seems to be settling down. Rodriguez (2-0) scattered four hits and three walks while striking out six over six shutout innings as Triple-A Sacramento beat Fresno, 6-3, at Chukchansi Park. With the scoreless outing, his ERA dropped to a season-low 3.45 after ballooning to 9.82 during his Triple-A debut. "Triple-A is a whole different beast than the other levels, but it gives you more of a professional feeling," he said. "The flights, the hotels and everything, it's a lot of fun and I'm just enjoying my time. It's really nice knowing the work I put in during the offseason and the transition I've done over the last five years has me at this level. It's relieving that it's all paying off and I'm finally seeing results, and I'm just taking it all in." Rodriguez is no stranger to the baseball clubhouse. His father made his Major League debut with the Texas Rangers less than a year before Dereck was born in June 1992. Until Pudge retired in 2011, Dereck said he -- more or less -- grew up around professional baseball. He experienced his dad's two World Series trips and 14 All-Star Games from the front row. Favorite memories are too many to count. So when he graduated from Monsignor Edward Pace High School near Miami in 2011, he was as prepared for the professional lifestyle as anyone in the Draft. "Living by myself for six months of the year wasn't as tough for me as it was for other guys. The whole learning process wasn't too difficult," the 25-year-old said. "I knew how to act in the clubhouse. I'd already lived it. It was common sense after I was there all those years." But easing into life off the field didn't translate to progress on it. Rodriguez finished the 2013 season with Elizabethton in the Appalachian League. To that point, he'd played 100 professional games and amassed just 74 hits at the lowest level of the pros. So the Twins decided to carry out the "Plan B" in Rodriguez's contract -- a move to the mound. Though he was caught off guard, the Arlington, Texas native wasn't exactly disappointed. Because of his arm, the Twins and other squads had considered Rodriguez as a pitcher straight out of high school. "As long as I was playing this game, I was happy," he said. "It didn't matter whether it was in the outfield or pitching. I just wanted to play." Rodriguez essentially started his career over from scratch, throwing less than 30 live innings during 2014 and spent a majority of his 2015 season back in the Rookie leagues. Eventually, he worked his way up to Class A Cedar Rapids and then Class A Advanced Fort Myers in 2016. And though he finished 2017 with Double-A Chattanooga, Rodriguez felt his time with the Twins was complete. He needed another fresh start and the Giants were willing to take a chance on the journeyman pitcher and son of a baseball legend. And, of course, an opportunity to throw batting practice to the likes of Pablo Sandoval, Buster Posey and Andrew McCutchen sounded appealing. "I enjoyed my time with the Twins. I got a good seven years with them. They taught me how to play the game the right way and hustle," Rodriguez said. "It was just time for a change, and I couldn't say no to the Giants." Through his seven-year journey, the one thing the righty said he hasn't struggled with is living and playing in his father's shadow. In fact, it's part of the reason he decided to go by his middle name rather than the first name he and his father share. The position change has helped Rodriguez carve his own path, though he enjoys working with the former Major League catcher in the offseason. "He's really helped give me good sequences of pitches to throw to hitters and what pitches to throw to guys depending on what their strengths are," Rodriguez said. "But beyond that, I don't think of him. When I'm out there, it's just me and the catcher when I'm on the mound." The elder Rodriguez has worked in Texas' front office since 2013 and does scouting during the majority of the season, leaving him little time to see his son play. 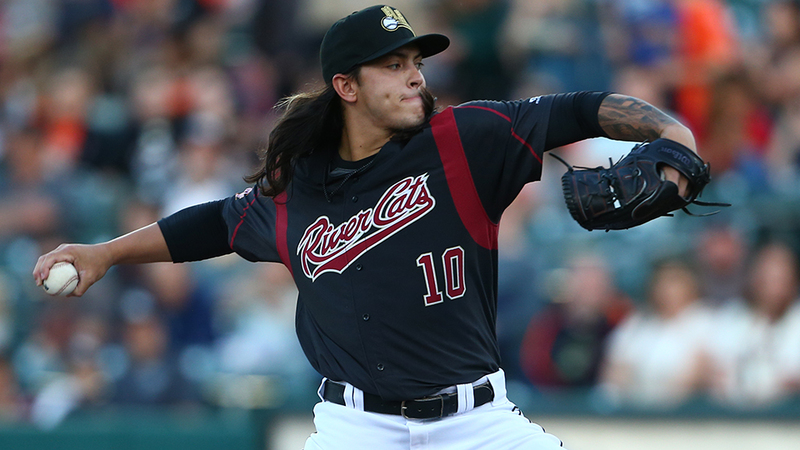 But when the River Cats travel to Round Rock -- the Rangers' Triple-A affiliate -- in June, Rodriguez said he expects to see the legend he knows, first and foremost, as his father in the crowd. "They keep him pretty busy, but I think he'll be able to kill two birds with one stone on that trip," he said.